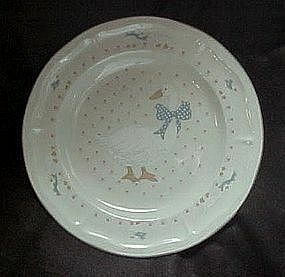 Nice large 10 5/8" diameter dinner plate's in the Aunt Rhody or blue goose pattern by Tienshan. These are the exact pattern that Brick Oven makes and are not distinguishable from each other. Pink calico heart background, white goose with blue polka dot bow, and blue edge trim. I have 3 available in this brand name, more in the Brick oven brand. All are perfect and price is for each plate.